Absolutely loving this! Thank you so much. @SkyJedi: How would you suggest I implement a bit of a house-rule? I allow Careers to include a choice of Skills. (So, for example, "Melee or Brawl" or "Any 1 Knowledge Skill"). Mostly because a concept that allows Brawl might also work with Melee, etc. You can't check the Career Skill box. So, each player creates the Career that maps to their 8 Career Skills? Once you make a custom skill in the custom Data tab you should be able to assign it to a custom weapon. But it needs to be don't under custom items. The modifier value for career skills is also under custom items. You can make a custom career, talent, or item that grants a skill as career skill. Once you make the custom Data (let's say you make a custom career) you'd assign that career in the main character page. Aha! — I've just worked out what the problem I was having was. Or at least how to fix it. I'd made the weapons a long time ago (A dagger and a bow) - and every edit I was making to them now wasn't being saved. However by making new versions of those weapons I can now save my edits to them. Minor suggestion; let weapons use more than one skill. 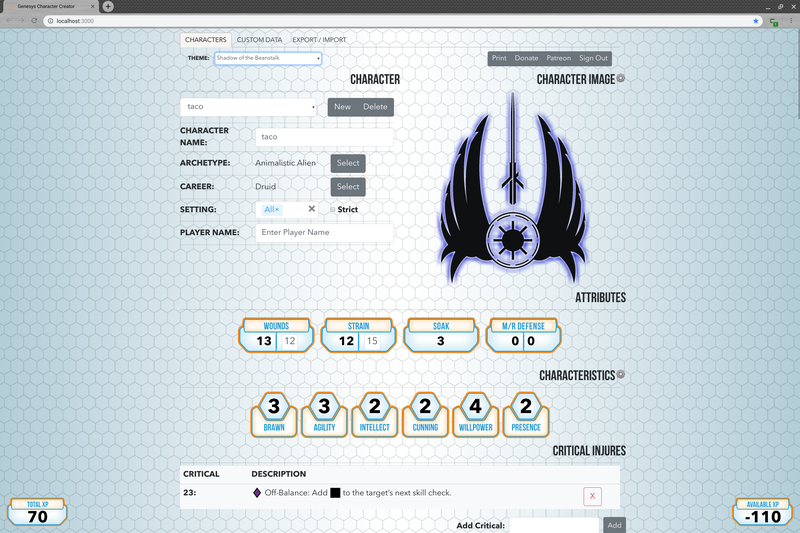 This way I can make replacement weapons as part of a data package for my players to import, and the same dagger works for everyone. Edit: Though I guess getting Talents to allow a Skill to use the best of two attributes might be a better long term fix. Huh. Now I can't get adding accurate to the dagger to save. Bug report 1: editing a talent, it looks like the Ranked dropdown isn't pre-populating. I was attempting to add a talent description to a default talent ("Bought Info" if that matters) and went back to make a correction when I noticed this. Bug report 2: my ipad (via Chrome) has some display issues with the wounds/strain/etc controls on the character record. The vertical pipe character drops onto a second line. Possible Bug report 3: it looks like you can't edit the name of the talent once it's created, so renaming would be a full replacement (i.e. delete and add)? I'm guessing editing the name would screw up indexing of the talent, but if it's editable, that's much more convenient. And of a final note: please o please o please don't ever shut this incredible utility down! Hand it off if you get tired of working on it! I'm planning to invest the time into entering full descriptions for all talents, so I would be gobsmacked if it disappears. Likewise, I'm going to share this with my group and then require them to use it. #2 this is an ongoing issue and it's because iPads are the spawn of satan and they don't follow basic html rules because they are better than us or something. Anyway, I'm going to g to circle back around to making it better at some point. #3 you're totally correct that the index is based on the name and editing would cause more issues. I'll sending the problem to my "thinkin' brain" and see what comes back. No plan on shutting it down, the patreon has covered most of the cost already. If I ever bore of it, it's open source and anyone can easily popup another instance . Remember you backups! Agreed that the iPad is the spawn of Satan, but it does what it does well REALLY well (most of which is more about great apps than a great platform). No real worries about either 2 or 3. During a session the players will be using paper anyway. I just wanted to draw your attention to it. I will back you on your patreon, btw. Well deserved. 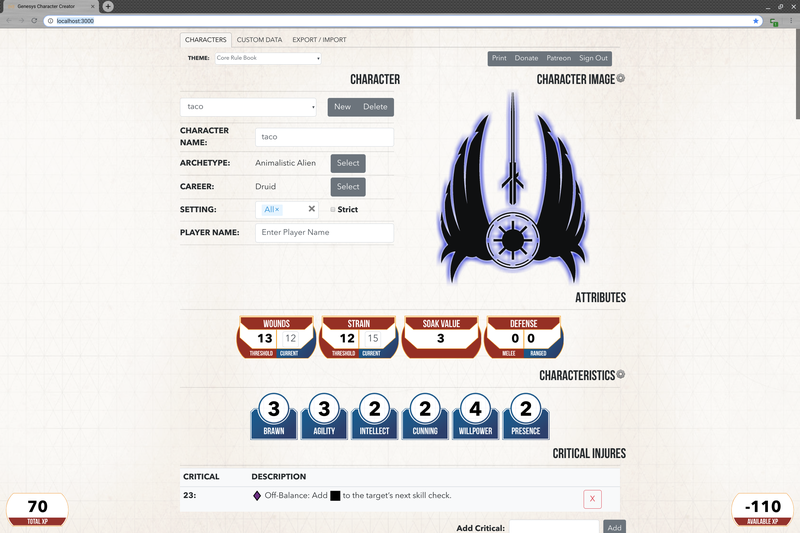 Feature Request: Dice symbols in Talent descriptions, etc. Perhaps via some regex matching (e.g., <Threat> becomes Threat symbol, etc.). Not sure how that plays out with trademarks and so forth, but this feels like it falls within FFG's historic level of permissiveness. Also, if you ever have to remove the feature, all the text reverts to "Gain <Boost><Boost> when you..." which is still legible. Sorry, I searched for "font" on every page. Not sure this is an issue so much as just a formatting standard, but it seems you need to include a space between a closing square bracket and an open one or the symbols following the first one don't display. So two difficulty would be [purple] plus space plus [purple]. Correct, there need to be spaces between the symbols. Under the Description for custom items, could you create a display preview so we can be sure it's formatting nicely? As is, I've basically been adding talents and then selecting them on a dummy PC record just to make sure they display correctly. Edit: actually, is it possible to create a browsable catalog of talents? That could be as easy as adding a description column to the existing list of custom talents. 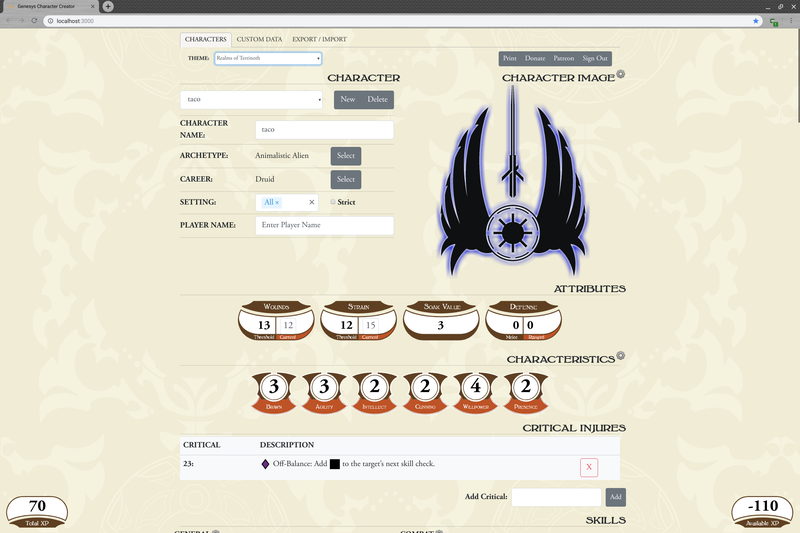 Basically, when building a character, if you want to "shop" for your next talent, you could navigate to that page to see them all laid out in a tabular fashion. One stop shopping is always good, and being able to scroll through a list of talents without having to comb through multiple rulebooks and electronic resources would be awesome. A one stop shop would be cool, it would also be really close to Cease and Desist area for me. My personal rule is I'm not going to build something that replaces the books. well, you wouldn't really be building something that replaces the books, though, at least not "out of the box". It's up to your users to load the custom data, right? You took the legal high ground with just providing the general link to the CRB and the capacity for us to replace the generic with specific as needed. Building a word processor isn't plagiarizing a novel. The preview would be most appreciated either way. These look incredible, by the way. And thank you for everything that you're doing. Could I ask that, on your shortlist (in your infinite free time), you take another pass at printing? Having dealt with my fair share of layout, I can't imagine what kind of CSS **** that print set up is, so I recognize it's a low priority for you. Just adding my voice. Again, this tool is invaluable. Thank you. One other note: What are item descriptions for? Where are they visible? I really like this, thank you! It's one of those features you don't know you want until you get it. One minor request (well minor to say, to do is another thing), would it be possible to have the weapons line on page 1 as well? I think it works where it is but it would be nice for dual wielders or players with multiple weapons to have them on the front page. This would be for printing only. There isn't a lot of room on the 1st print page. Skills take up a massive amount. At some point I want to make a compact print that is only a single page. I think that would solve your issue. Fair point. I've been using Fantasy/Magic settings and the skills are reduced so there looks to be more room than what a full list out would have. You're thinking about it and there's a wish list item that should fix it. Thanks again. It is a really great tool.